Okay, so it's been about fifteen years since Doug Henry catapulted the Yamaha four stroke dirt bike onto the forefront of the motocross scene, and yet the two stroke vs. four stroke debate still rages on. There shouldn't be any debate at all about which bike is better because they're both great bikes, and each rider will have their individual preference based on riding style. A two stroke isn't "better" than a four stroke – it's just different. So what's the difference between a two stroke and a four stroke? The two stroke engine involves two processes: compression and combustion. The engine fires and the spark plug ignites once every revolution of the crankshaft. It's a simpler process with fewer moving parts, which makes them easier to work on and lighter in weight than a comparable four stroke. Two stroke engines are slightly less costly to maintain than a comparable four stroke. The greatest joy of riding a two stroke dirt bike is its unpredictable power delivery, which can either be scary or an absolute adrenaline rush depending on your level of riding experience and your personality. 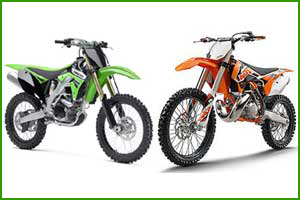 Two stroke dirt bikes made for the trail (such as the KTM 250-XC) are slghtly easier to ride that the two stroke motocross bikes (such as the YZ250) because they have more of a linear power delivery. Aggressive beginners might be able to grow into a two stroke, but if you've never ridden a dirt bike before or are somewhat cautious by nature, a four stroke is probably a better idea. The four stroke engine involves intake, compression, combustion and exhaust. It fires only once every two revolutions. They require a bit more maintenance due to more moving parts, they weigh more than a comparable two stroke, and some riders don't like having such a predictable powerband. The motocross four strokes are quite a bit noisier than the motocross two strokes, but the four stroke trail bikes are relatively quiet. The power delivery of most four strokes is steady and predictable (linear) making them a great choice for beginners, but that doesn't mean there aren't some killer four strokes on the market. It isn't as big an issue with competitive trail riding, but if you plan to compete in motocross and are thinking of buying a two stroke, you may want to at least consider a four stroke. Many will argue that today's motocross tracks are being designed and groomed for the four strokes as far as jumps and corners. The engine braking of the four stroke makes a difference when handling the bike over the jumps as well as dealing with rutted or bermed corners. There are more four stroke beginner dirt bike bike models available than beginner two stroke models and if you've never ridden before or are apprehensive about learning to ride a dirt bike, go for the four stroke. Here's a two stroke vs four stroke mini-shootout vid that has two pro riders (Jason Lawrence and Travis Baker) taking a turn on a 2t and a 4t, then offering their honest opinion about what they like and don't like about each bike. The nice thing is that the bikes are basically stock bikes, not pro-level works bike. The second video shows how a 2 stroke engine works.